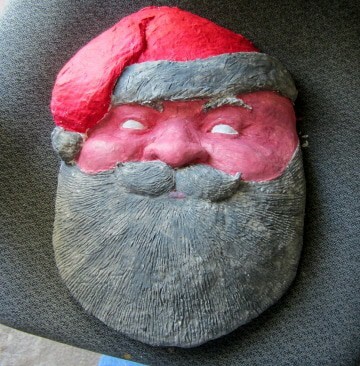 If you read the previous post, you know how this Santa portrait mask was made. Now he’s all ready to paint. 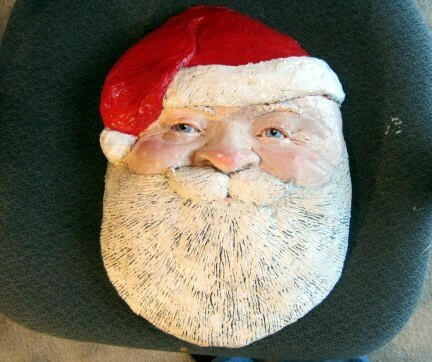 The deep texture that I put on the beard made the painting step go really fast.Use a damp sanding sponge from the hardware store to smooth your Santa. The damp sponge keeps the dust from floating around in the air. 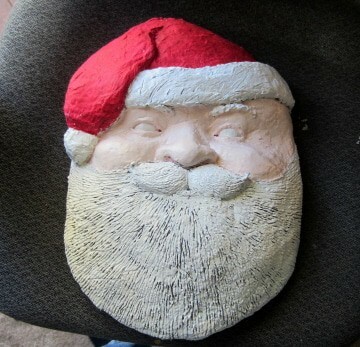 To make him even smoother, you can give your Santa several coats of home-made gesso, damp-sanding between each coat. You can find the recipe in the Art Library under the Paper Mache Recipes tab. I used a grey undercoat on the beard and the fur of his hat, and red on both the hat and the face. It looks rather startling in the photo, but it will be covered with the next colors. Then I used a warm white on the beard. With an almost-dry brush, I tried to catch only the tops of the ridges so the darker grey would show in the crevices.To make a warm white, add a small dab of yellow ochre to your white paint. The face was painted with Northern European flesh color (white, cadmium red, yellow ochre, and a touch of burnt sienna.) It took several coats, with variations in the amounts of the colors in the mix, until I thought he looked OK. Hint: if you make a lot of sculptures featuring people faces, you’ll want the book Color Mixing Recipes for Portaits. I use my copy a lot, and it saves a lot of time. 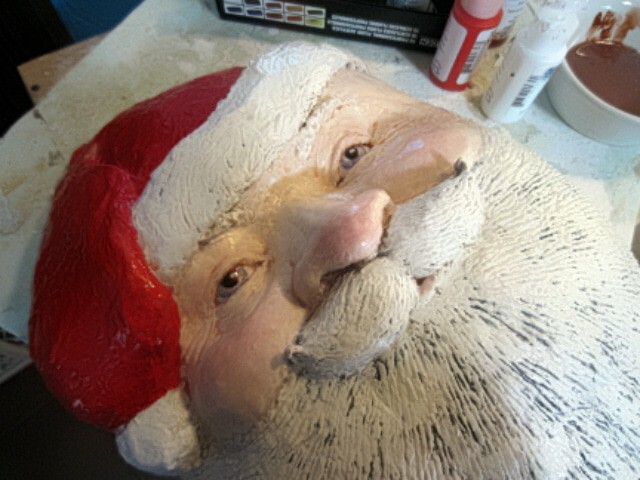 Next,I gave Santa some rosy cheeks and a pink nose (he spends a lot of time out in the bright, cold snow, after all). The eyes are a light grey-blue, to match his overall color scheme, and to give him a Nordic look. 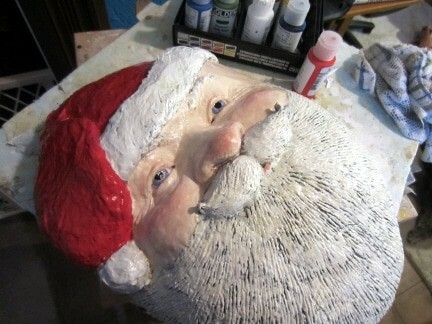 After the cheeks and eyes were painted on, I sealed Santa with a coat of matte acrylic varnish. When that was dry, I mixed up some of the same varnish with just a few drops of burnt sienna and one tiny drop of ultramarine blue, so the mix was a very thin brown. 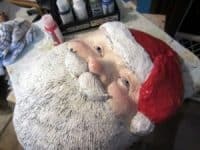 I brushed this over the sealed Santa, allowing the pigment to flow into the deeper laugh lines and around the eyes and nose. I then finished covering the rest of the beard and hat, and the very light brown helped to bring the colors together. These two coats of varnish will make it easier to wipe the dust off Santa next year. I added two white highlights to the eyes, used my glue gun to attach a wire hanger on the back, and he’s done. If you make a Santa of your own, please come back and show him off. I’d love to see how your Santa turns out! Hi Jonni – thank you for this great tutorial! I do have one question – how do you hang them? If I can, I hope to finish the ones I am working on for this year’s Christmas presents. I am still in the drying stage. I ordered the book you suggested for painting, but your tutorial was great, too. I hope to give them a hanger like a picture, but worry about it. Any Suggestions how to hang the masks? Hi Harriett. If there is no back on a wall sculpture, I just use hot glue to attach a toothed hanger to the back. I bought this box of hangers from amazon.com, but you probably don’t need quite that many. 🙂 Another option that I’ve been using for my recent mask patterns is to create a cardboard hanger for the back. It’s a shape that matches the top of the mask, with a notch cut out for the hook or nail. Jonni, love your site.This is my first try at paper mache for years. Just have a question. I am making my granddaughter a Olaf snowman and would like to know how firm the armature need to be before adding the air dry clay? The armature is the part that supports the finished sculpture, so you should make sure it is reasonably firm. Hi Jonni, We love your Santa face, We would like to buy two of them, we would only need made the Hat, Face, Moustache but without beard, if you sell them what would be the cost for two of them without beard? Hi Lisa. I don’t sell the Santas. I gave this one away, in fact. Since I gave the instructions, you might be able to find someone locally who could make one for you.